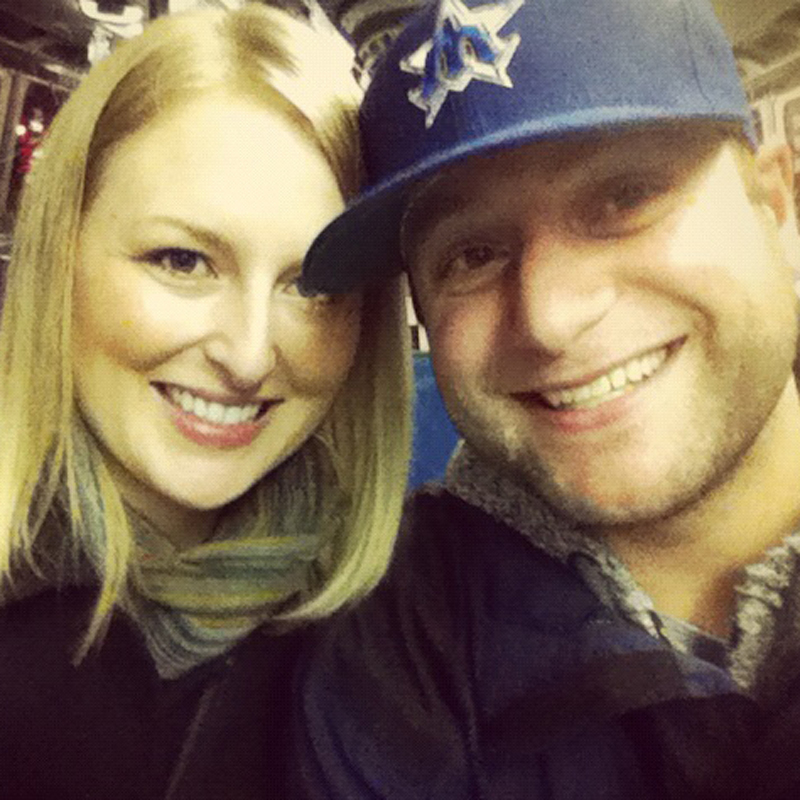 No visit to Seattle is complete without a at stop for some grub at Ivar’s. The local seafood chain has been making tasty food in Seattle for 75 years, and there’s no sign of them slowing down. With fast-food chains and full-service restaurants, Ivar’s is a classic Seattle eatery worthy of attention from locals and tourists alike. The Ivar’s story starts with a fellow named Ivar Haglund. In 1938, the Seattle man opened the city’s first aquarium on the waterfront. He quickly began selling fish ‘n chips and red clam chowder to aquarium visitors. The food was an instant hit, and the rest is history. Haglund and his famous seafood restaurants have made such an impact on Seattle that his nicknames include the “King,” “Mayor,” and “Patriarch” of the waterfront. Today, Ivar’s has restaurants as far north as Bellingham, as far south as Tacoma, as far east as Spokane and everywhere in between (including multiple locations around the Seattle area). There are 24 fast-food seafood and fish bars and three full-service restaurants: Ivar’s Acres of Clams (1001 Alaskan Way), Ivar’s Salmon House (401 NE Northlake Way) and Ivar’s Mukilteo Landing (710 Front St., Mukilteo). Ivar’s also has several regional concession stands, including locations at Safeco Field, CenturyLink Field, and KeyArena. Ivar’s Seafood bar on the Seattle waterfront. Tim and I typically hit up the fast-food version of Ivar’s. It’s quick and convenient, and the food is tasty. 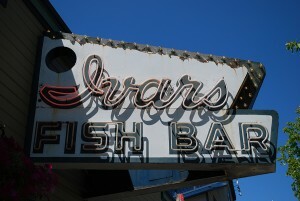 We especially love the Ivar’s seafood bar located on the waterfront at Pier 54. It’s in the heart of the waterfront action and it’s a fun place for lunch. 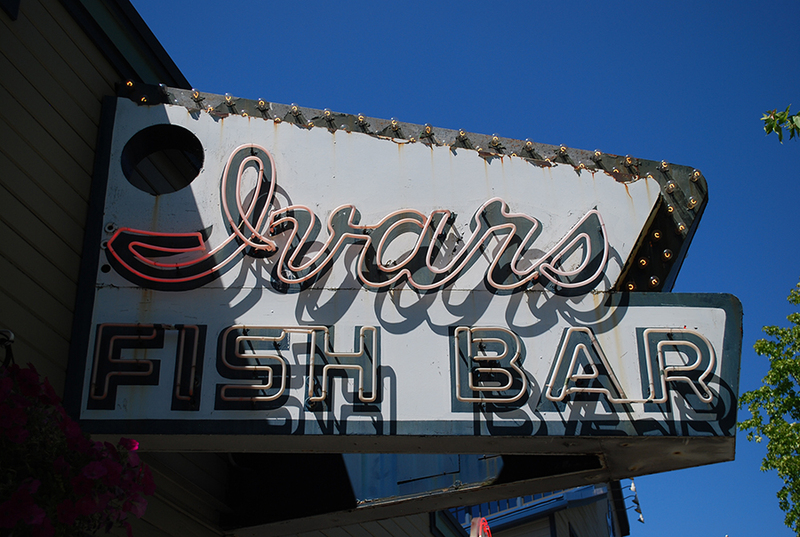 While there are many different options of where to get your Ivar’s, you’ll find the same great seafood on all the menus. A few of our favorite menu items include fish ‘n chips (cod, halibut or salmon), scallops ‘n chips, prawns ‘n chips, the “world famous” white clam chowder, and shrimp cocktail. The full-service Ivar’s restaurants offer “fancier” menu items that you’d find at any other typical sit down seafood restaurant, including Dungeness crab and lobster tail. 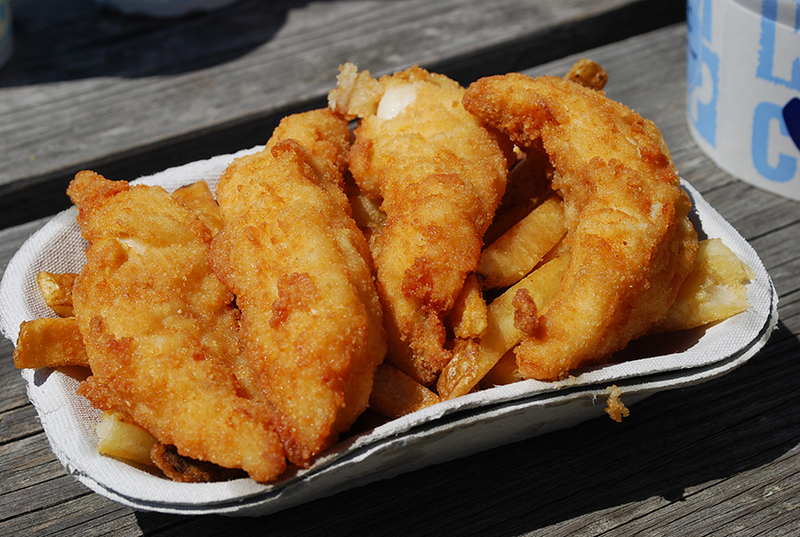 Ivar’s classic fish ‘n chips. 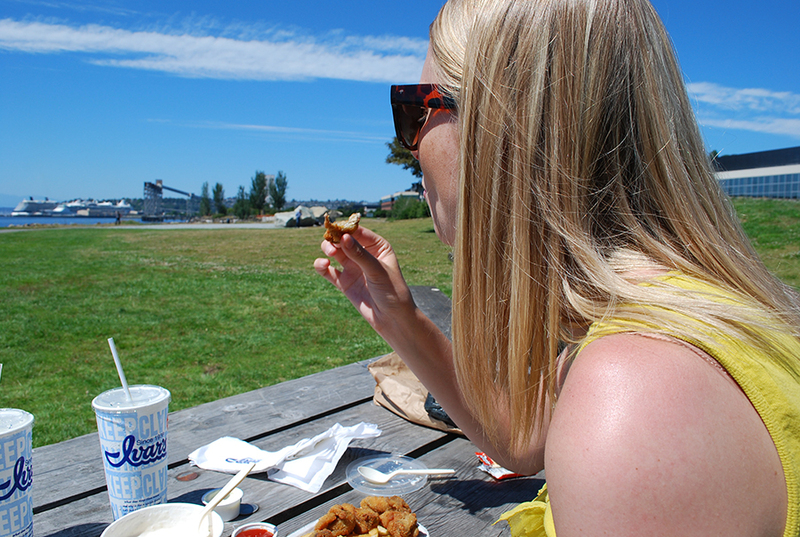 It’s hard to live in Seattle and not love seafood. I know Tim and I sure enjoy it. Ivar’s is a great place to enjoy some quick seafood, especially when you don’t have time for a long sit down meal. Plus, it’s a Seattle icon. 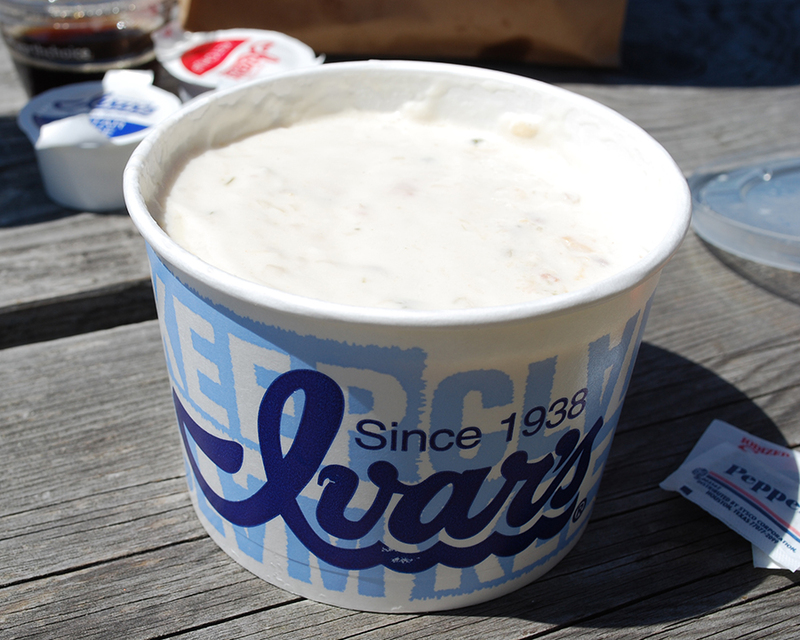 You simply can’t go wrong with a visit to Ivar’s. Have you ever eaten at Ivar’s? What is your favorite item on the menu? What’s your favorite memory at Ivar’s? We’d love to hear from you! Please leave a comment below or connect with us on Twitter, Facebook and/or Google+. Don’t forget to also check out Seattle Bloggers for more great places to eat and drink in the Emerald City. Me digging into my Ivar’s lunch.